When talking about Roman food, there is a tendency to talk about Apicius and gourmet foods and forget that many people ate a much simpler fare — sometimes just above sustenance-level and often, it was pretty monotonous. However, there was a middle-ground in what most Romans ate and we will try and cover it here in this area of the site. Poor Romans ate bread, vegetable soup, and porridge. Meat was a luxury, unless they lived in the countryside and could go hunting or fishing. Poor people's small homes had no kitchens. So they often took their foodstuffs round to the baker, to cook in his oven. Most people in the Roman Empire lived mainly on the usual foods of people living around the Mediterranean Sea — barley, wheat, and millet, olive oil, and wine, which is sometimes called the "Mediterranean Triad." In addition to being full of carbohydrates, these foods provided fat (the olive oil) and protein (the barley and millet). Poor people ate more millet, and rich people ate more wheat. Starting around 100 AD, poor people started to eat oats, too. If you were poor, you would also eat vegetables like lentils and cucumbers, onions, garlic, and lettuce, fruit like berries, apples and figs, nuts, and sometimes cheese and eggs. 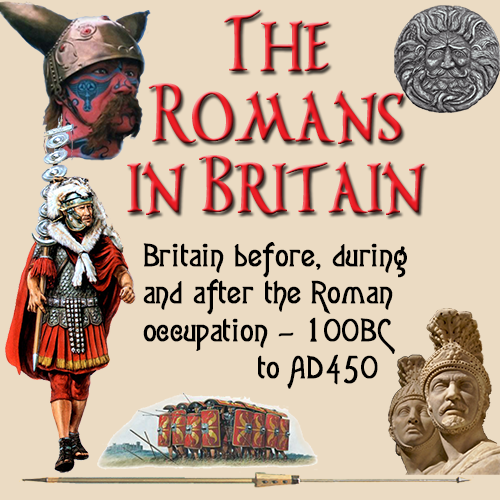 The native Briton would have seen little change in his diet after the Roman occupation. Most people would have had to exist on meagre and monotonous meals, with flat bread made from course grain flour, bean pottage or porridge — all cooked on an open hearth fire, in cramped conditions, as their normal daily food. Excavations in Cirencester, of skeletons from the Roman period, have revealed evidence of dental damage beginning early in life and largely the result of a course and insufficient diet. The Celtic peasantry, who formed the mass of the population, would have seen the least change to their diet. 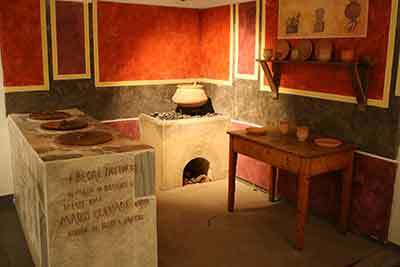 They would not have dined on fine Roman cuisine but even they did benefit from the introduction of some of the new vegetables and herbs. They would have added these to the stews and broths that they cooked above the fire, in the traditional Celtic manner. Some natives were re-settled into new Roman towns, such as Caerwent in Wales, and amongst them was a new class of urban poor. The Vindolanda tablets provide a good source of information about the dietary requirements of the Roman Army stationed at Hadrian's Wall. It is especially informative about the food ordered for the Commanding Officer who like other rich Romans enjoyed meats such as venison and wild Boar. The following tablet, found at Vindolanda, contained a 'shopping list'; of the food that was probably intended to feed the garrison. ... bruised beans, two modii, twenty chickens, a hundred apples, if you can find nice ones, a hundred or two hundred eggs, if they are for sale there at a fair price. ... 8 sextarii of fish-sauce ... a modius of olives ... To ... slave of Verecundus. The Roman Army consumed a healthy combination of simple high-energy food. Bread was their staple food and grain production was increased throughout Britain to meet the demand from the army. Large 'beehive' bread-ovens were positioned all the way around the Legionary Fortress at Caerleon. 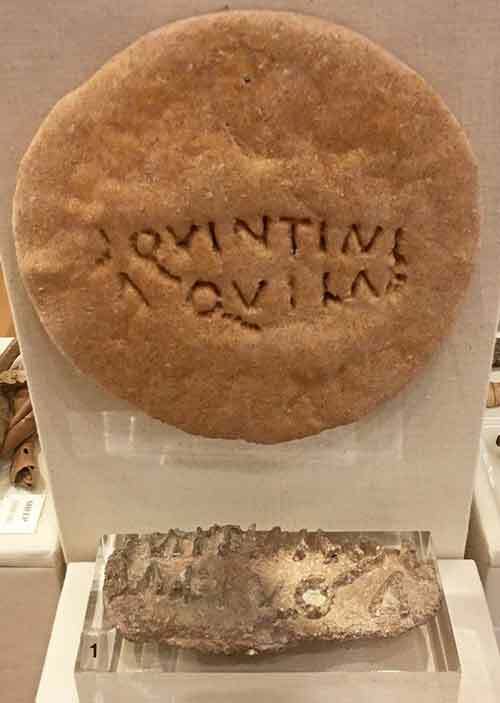 A lead bread stamp, reading ‘Century of Quintinius Aquila’, found in the Fortress suggests that each Century of soldiers baked and consumed their own bread. Accounts from Vindolanda indicate that Roman soldiers also ate a lot of bacon. Every group of eight soldiers had a frying pan that folded away in their pack and enabled them to have a fry-up even on campaign. They also ate porridge and stews would have included meat and vegetables. Soldiers snacking at the Fortress Baths in Caerleon certainly ate lots of chicken and bones discovered there had been boiled white. Wild boar was another favourite treat that the soldiers could have bought from the bathhouse vendors. If I were to spend a day in camp as a legionary of the 3rd century, what would I be eating? In the legionary fort the soldier would eat as well as any civilian — if not better, supplied from a storehouse (horrea) inside the fort. Bread was the staple food, with vegetables and beef both proving popular additions. In Northern Britain mutton was also popular, probably due to the prevalence of sheep in the locality. Pork was used across the Empire as a basic legionary foodstuff. There are books on Roman cookery, and that isn't what I'm interested in here. I want to know what a legionary carried with him to war, or out on patrol. What was camp cooking like? The Codex Theodosius (7.4.11) dating from 360 states that troops on the move should receive hardtack biscuits (buccellatum), bread, ordinary wine (vinum) and sour wine (acetum), salted pork and mutton. It seems that hardtack and acetum would be consumed for two days, and on the third day the decent wine and bread would be eaten. Troops were ordered to collect twenty days rations from the state warehouses before a long campaign, and carry these rations themselves. We have other sources which tell us how bleak the marching diet was. Vegetius remarks that soldiers should have "corn (ie. wheat), wine, vinegar and salt at all times". That wheat ration will have come as hardtack biscuits. The Emperor Hadrian lived the life of a regular soldier for a while (SHA, Hadrian X, 2) and enjoyed "larido, caseo et posca", which was bacon fat, cheese and sour wine (also called acetum). Ammianus (xvii) also mentions buccellatum. Avidius Cassius, a general who rebelled against Marcus Aurelius, ordered his troops to carry nothing except "laridum ac buccellatum at que acetum", i.e. bacon fat, hardtack and sour wine (Avidius Cassius, v, 3). What kind of a menu can I create, then? 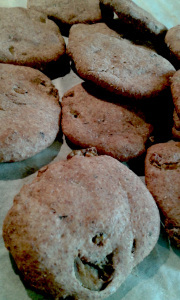 Obviously, buccellatum (hardtack or wheat biscuits) will feature quite highly, as will bacon and lard. Using just those ingredients Northern troops in the American Civil War concocted "skilleegalee", hardtack crumbled into bacon and hot lard. I've tried this for breakfast at events, and it does the job just fine. Buccellatum can also be fried as they come, or soaked in water till mushy and fried or put in the pot with other ingredients. Remember that hardtack is a way to preserve the wheat ration. It is essential. Wheat or barley could be carried, but would need to be ground before use, using portable millstones carried by the conterburnium's mule. Flour can be carried on its own. It is much more prone to damp and spoilage than wheat grains, but mixed with water and lard and slapped onto a flat stone warming next to the fire (or onto a frying pan) an unleavened bread can be cooked in minutes. 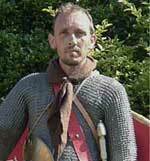 Bread is always the major food source; flour or hardtack are essential for the legionary's survival. We know that the Romans loved smoked cheese — and so that might be on the soldier's marching menu (in fact Hadrian explicitly says so). What about boiled eggs? A few apples? Some vegetables (leek, onion, radish, celery, cabbage, parsnip, carrot — take your pick). For a short patrol, how about a slice of beef or pork, perhaps a few lamb chops or chicken drumsticks? Of course the big factor here is, how far are you going? For a two day hike your wife in the fort (if you are limitanei) can pack left-overs to fill your belly. For a week or two on the frontier or beyond, or a march to the Channel to cross for a campaign in Gaul, all your rations are going to be dried, salted or smoked. My aim, then, is to try both types of rations, probably eating hardtack and bacon for breakfast (bacon butties anyone? ), and using fresh food for a meal in the evening. Remember that armies were always feared for their locust-like tendency to take whatever they liked from farms and towns that they passed through. Current working list — not in any order so far, other than as I made the pages.